The symbol of Kotobuki is composed of two symbols - one symbol means "praying for a good harvest", and another symbol means "old". It has a traditional meaning "wishing one's longevity", and now it's commonly used to celebrate marriage, birthday, pregnancy, new birth or long life or simply means "Congratulations". How to pronounce is "ju" in Japanese or "shou" in Mandarin Chinese. 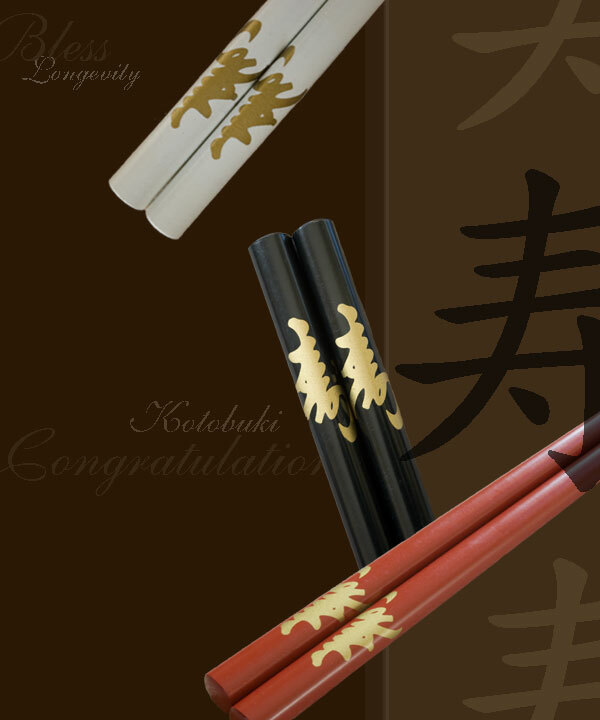 Our Kotobuki chopsticks are wonderful additions to your special celebrations. Kotobuki is a classic way of expressing something to celebrate the happy event and used for greeting. For additional charm and convenience, each set of our Kotobuki chopsticks will arrive pre-packaged in a beautiful cellophane pouch.